This is the best vacuum that I EVER had. It has so much suction power and really gets the dirt out of the carpets. It is pretty heavy but is not hard to move around. With 4 dogs it gets used daily. Quickly clean even larger homes with this high-quality black vacuum cleaner from Kirby. This HEPA filter vacuum cleaner comes with two disposable HEPA bags, allowing it to easily trap allergens and contaminants in the air as you clean. 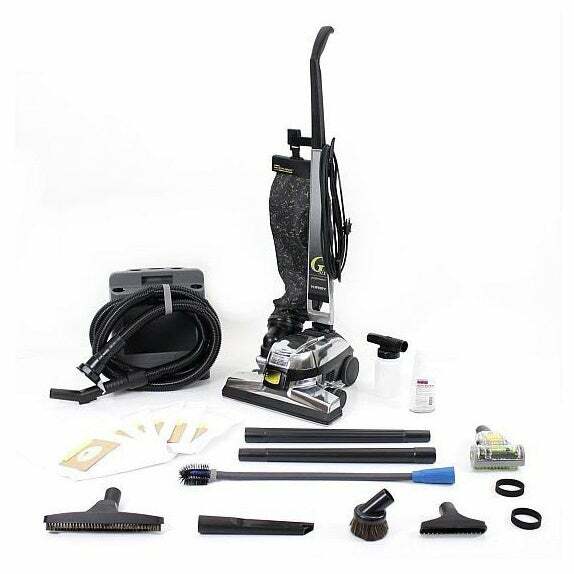 Each vacuum also includes a set of deluxe vacuum tools for help with hard-to-clean and hard-to-reach parts of your home. I bought this vacuum because my mom would no longer let me borrow hers. She bought a kirby vacuum 10 years ago, for three times as much as I spent on this one. She has only had to replace the bags and belts on hers, and paid for an upgrade a couple years back. I have no regrets with this purchase. It came faster than I expected, and I think it works better than the one my mom owns. Although, to be honest, I probably feel this way because this one actually belongs to me. I would recommend this product to anyone who wants to purchase a vacuum that works great and lasts for years. I ordered the G6 and gut the ultimate G instead. The machine housing does show some signs of wear, and the interior of the outer cloth bag is pilled. Do not expect the shampoo attachment or the hand use handle. They are not in the description. The large square item in the photo is the Kirby made tool caddy, which one does not receive. I received a cloth holder with pockets on it. The two long pockets on each side hold the wands. What should have been one central, deep pocket is instead two shallow pockets which are not deep enough to be of any use. I use on of these nylon fiber reinforced plastic tote bags sold as a reusable shopping bag by a local discounter. The vacuum is fabulous. I have used it three or four times and there is about four cups of dirt in the disposable bag. Attaching the tools requires removal of the carpet nozzle and the machine end of the hose pushes a switch that makes the motor run faster for vastly improved suction with the attachments. The dusting brush has some sort of natural bristles on it and a nice, large opening in the center so dust and dirt are sucked into the bag instead of collection on the bristles. The pet hair tool is one of these contraptions run by suction of air over two small "paddle wheels." But there is so much suction that this does not matter and it works quite well. There is no owner's manual, but there are Kirby produced videos on YouTube and the Kirby site has an archive of downloadable manuals, since the machines last for decades. One can also purchase after market attachments or, as I will do, go to Kirby for the hand held cleaning handle. Also, be aware that the head of the machine is very large and the whole thing weighs about 25 pounds. Thank goodness and the gods that it has Kirby Tech Drive, their version of self propulsion. Makes it feel like I am pushing the powered nozzle of my old Kenmore cannister. I absolutely love it. Great vacuum. When I tried it out after using my cheap old worn out vacuum I had a third of the bag full and didn't even hit the bedrooms yet. Great atachments too, hose is very long and gets into every area I needed to. I sold Kiry vacuums when I was a kid and this is the real deal but at a bout a third the price as I remember in 1980's dollars. Great buy! I purchased from overstock a little over a year ago. The vacuum works great, I love the extremely long hose, it make's reaching high places much easier also the cord make it nice your not constantly having to unplug and re plug to reach large areas. my only complaint is the attachments are very flimsy and cheap the one head hose attachment I received is very small and makes it take twice as long to vacuum a large space. But the vacuum itself is great, I have had a Kirby for the last 40 years, as I grew up using a Kirby, they last forever. And I have never had a hose attachment set this small or flimsy so that part is defiantly after market parts. I love my "new" Kirby!!! I have owned a Kirby vacuum for years, and knew the great quality that they represent. When my old one finally gave up about a year ago, I went to the store and purchased a regular commercial vacuum. What a mistake and waste of money. It lasted a year or less, and I was never happy with the quality of cleaning that I got from it. Determined not to make the same mistake again, I was really happy to see that Overstock had refurbished Kirby's that saved me a lot of money on the quality product that I wanted. It is like new condition and works great. Although it's a heavy vacuum, as others have noted, it is a breeze to push and I finally have the kind of deep clean that I just didn't feel I got with other products. I purchased a refurbished Kirby G-six in from Overstock.com on 10/14/13. My first issue was that there was no printed user manual. I had to go to the website and decided that it would be prudent to print all 58 pages. The parts diagram is unlabeled, making it a challenge to interpret some of the instructions. When the G-six arrived there were 8 accessory pieces shown in the description on Overstock.com that weren't included. I used the G-six less than 2 months before a winter break of 4 months. During the first use after returning, the Belt Lifter broke off when I engaged it. There was rust on the belt lifter where it connected to the power head, the rings were out of shape, and the screw holding it in place chewed off. I contacted Great Vacs (the seller) & they said that only the motor of the Kirby was covered under warranty. I had to purchase replacement parts, which I found online. Fortunately my husband is very mechanical & could make the repair. The next issue was the G-six would not operate at all. It was a bad cord. This was covered since it connects to the motor. Great Vacs charged $ return shipping & I had to pay for shipping it to them. The front wheel fell off next. This was also covered, but again I had to pay to have it shipped plus the return postage of $ When it is in working order the G-six does a good job. I like the self-propelled feature as this vacuum is very heave to push. It is rather loud, but what vacuum isn't. The hose for the attachments is 12 feet long, making it possible to get to hard-to-reach places. All in all, the G-six cleans no better than a $ ****** that I purchased to use during the G-six down time. I would not purchase this vacuum again, since I have spent over half of the purchase price in replacement parts and shipping charges. Great vacuum cleaner. Kirby quality within my budget price range. Works perfectly. More accessories than I will ever use. I am very happy with this refurbished (like new) vacuum. The motorized assist in pushing the heavy machine around is wonderful. I ordered the refurbished Kirby after my Kirby vacuum broke down. After reading up on the various models and values, I chose to order the next model after my own instead of more recent models as being a reliable performer and having good ratings. I also loved my older machine and appreciated the many years of hard use that I gave it. Every thing arrived as described, on time, intact, with new accessories, (not quite the quality of my older ones) and when not new the pieces worked very well with smooth bearings and performance compared to my older heavily used accessory. I am pleased with the order of my refurbished Kirby which I was able to purchase for less cost than with my local dealer. Yes, I will always consider Overstock when seeking to find a good product because of their reliable reputation and my past experience with my orders. Works great. Third one we have purchased. We had one for our house and tried other vacuums for our small residential care home. Went through 2 vacuums and with mediocre results. decided our Kirby worked great at home why not our care home. Has been working great ever since. Thanks O.co! I did not receive shampooer attachments. Although purchased refurbished the quality of the vacuum I was sent is poor. Poor suction, lever to raise and lower doesn't work right. Not sent original accessories for vacuum. It doesn't deserve the one star. I sent this back- A very very well used and scratched up kirby was sent in about 1000 pieces- did not match description and there were no assembly instructions. I taped up the box and sent it back. I did not receive the Kirby G-six vacuum. There was a note in the box saying that one was no longer available and they sent an "upgraded" Kirby instead. I suppose "upgraded" means a newer model, but it wasn't an upgrade to me. Since it appears most retailers online get their refurbished Kirbys from the same company out of Utah, I decided to keep the one they sent, since two weeks before, I had ordered a Kirby G-six off Amazon from the Utah company and again received a different model, however that one didn't work properly, so I sent it back. This time, the replacement model I received did work, seemed to be in good condition and hopefully will be fine. BUYER BEWARE - you MAY not get the vacuum you ordered. Best vacuum for picking up pet hair ! Great value for the money ! Well made , but it is heavy! I'm having a hard time giving this a rating. I bought the refurbished Kirby, and when it works right, it's awesome. The problem is, it only works right about half the time, if even that much. We tried having the belt replaced in case that was the issue, but it wasn't. I'll vacuum a rug and it'll be giving powerful suction, then a second later it can't pick up anything. I can hear and feel the difference between when it's really working great and when it goes all weak and useless, but have no idea why it's happening. I'm beyond the return window, so now I have this very pricey machine that's extremely iffy in its performance. It is very heavy and did not work properly for me. The used (not refurbished) vacuum was randomly and in pieces put in a box and shipped. No packing or anything. Just a lot of vacuum parts and cords. Nothing was packed at all but it is very scratched up. Definitely sending it back. Suction is great. Kirby G is a great machine. 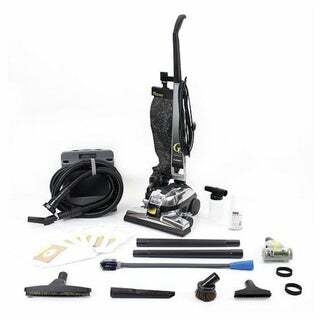 "hi, 1. i want to buy KIRBY vacum cleaner/ What is the diffent between G-5 to G-6 ? 2. In my country we are using 220 V. How we can fit the product to our condition? Thank you "
All electrical items are wired for US standard 120V usage. Many companies do not recommend using their products with power adapters. Doing so commonly voids warranties. We do not recommend using this vacuum outside of the standard 120V requirements. "Are the new attachments manufactured by Kirby or are they after market attachments designed to work with the Kirby vacuum?" Hello mh vidal, the new tools which come with our Kirby packages are going to be an aftermarket tool which will work with the Kirby vacuum. The carpet shampooer attachment will still be genuine Kirby, but any Kirby with the 10pc tool kit will be an aftermarket tool kit. Have a great day! "The 5 year distributor warranty if thru overstock.com?" Hello Ray2468, thank you for your inquiry. Unfortunately, the information you have requested is currently unavailable. You will receive an email notification once an answer is posted. Have a great day. "I have the g4 which I have had for 20 years it has self propelled option does this one have it"
Hello mariah, this also features a self-propelled option. Have a great day! "I understand that the vacuum itself is refurbished, but are the accessories new (i.e. brush attachments, wand etc.) Also, was this item factory reconditioned by Kirby?" Hello bbs7714, yes the accessories are new, all vacuum tools are brand new. This is was also reconditioned by Kirby. Thanks for shopping with us! "Does the warranty start from the date of purchase?" Hello momabear64, This vacuum has received excellent reviews! This comes with a 5 year warranty, starting on the day the order is placed. The warranty covers the motor, all bearings, the fan, and the transmission. I hope this information helps. Thanks for shopping with us.